Sugar cookie dough is one of the most versatile, from-scratch dough recipes you can have in your dessert arsenal. 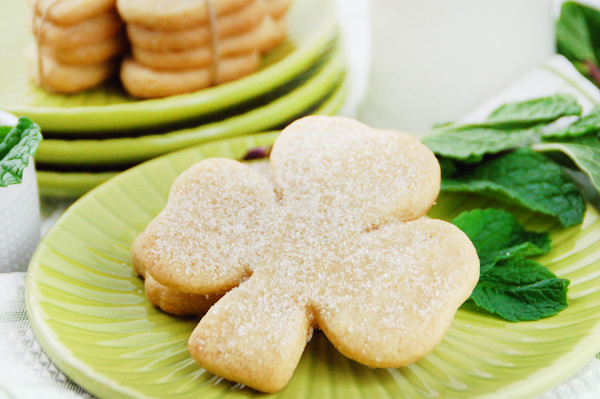 Here we’ve kissed it lightly with minted sugar in honor of St. Patrick’s Day. Nope, no artificially colored green sugar crystals here. We’ve made our minted sugar from scratch with real mint. In a medium bowl, combine 1/2 cup of the sugar with the mint leaves. Rub leaves in the sugar to release their oils; set aside until ready to use. In a medium bowl, whisk together flour, salt and baking powder; set aside. In a large bowl, using an electric mixer, cream butter and sugar; mix until light and fluffy. Add egg, milk, vanilla and peppermint; mix until well combined. With the mixer on low, slowly add flour mixture. Mix until just combined. Transfer dough to a lightly floured work surface. Shape into two discs, cover with plastic wrap, and refrigerate for at least one hour. Preheat oven to 350 degrees F. Line baking sheets with nonstick baking mats or parchment paper; set aside. On a lightly floured work surface, roll out dough to 1/8-inch thickness. Using a shamrock-shaped cookie cutter, cut shamrocks and transfer to prepared baking sheets, leaving an inch in between. Leftover dough can be rolled and cut once more. Bake until lightly golden, about 10 minutes. Transfer to wire racks to cool. Remove and discard mint leaves from sugar. Brush each cookie with a thin coating of cream and sprinkle with minted sugar.